From October 2015 to January 2016, I was one of six artists-in-residence at the Museum of Arts & Design in New York City. Every Friday, I would set up my materials and displays in the sixth floor studio and get to work for the day. Some days would have a steady stream of museum visitors while other times would be very quiet. Visitors were encouraged to be curious and inquisitive, and to talk with me about my work as much as they wanted to. At the end of each Friday, I would dismantle my temporary studio and display shelves, putting everything into storage cabinets in order to prepare the studio space for the next day's artist, until I would return the following week to do it all over again. 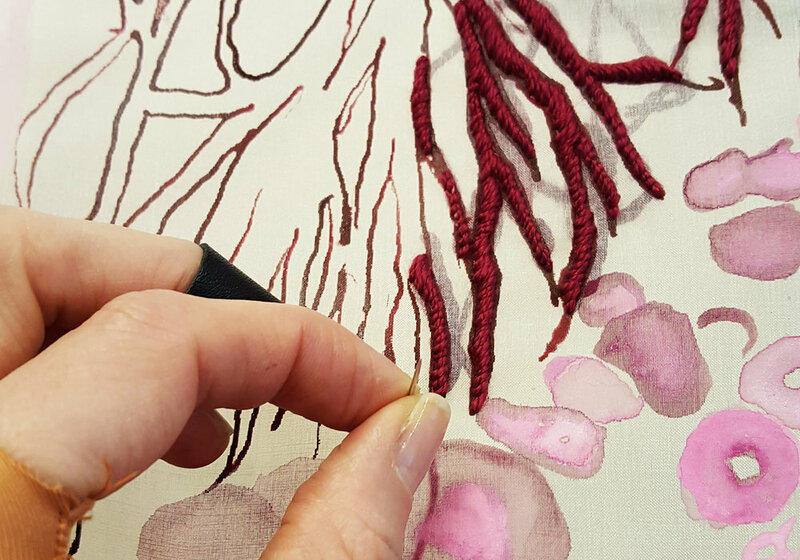 Embroidery is a very slow medium which requires one's complete attention, so an average day at the Museum would be split between making the work about half the time and talking about the work, my process, and my inspiration the other half of the time. For me the highlight of my residency was the diversity of the visitors who came through the studio and the conversations we had. I hope that I was able to open their eyes to the possibilities of embroidery as a contemporary art form, and I remain grateful to everyone who engaged with me during my residency. A view from the outside of the studio, looking in. All photos by Megan Canning unless otherwise noted.